Clocktower Productions presents former Clocktower Gallery resident Julian Bozeman's video installation, Dream Driver, which greets visitors to the Clocktower Radio studio operating out of Pioneer Works, Center for Art and Innovation. The exhibition is on view Wednesday through Sunday, from 12 to 6pm. 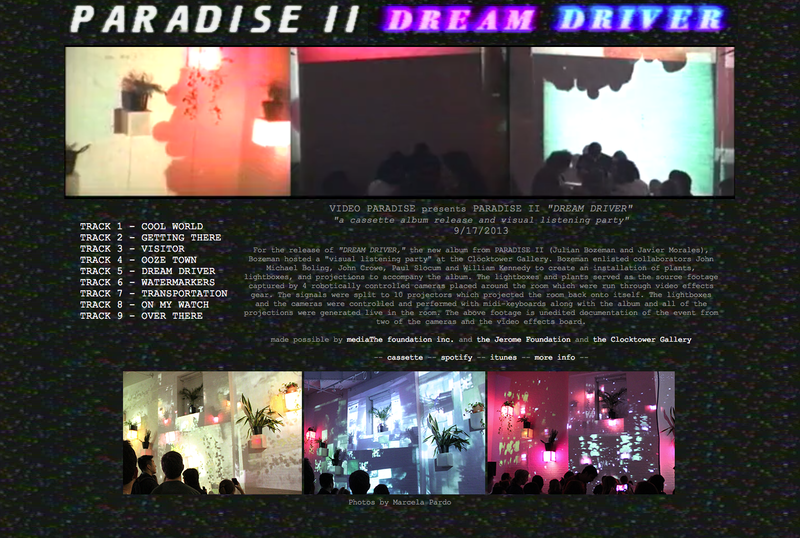 Dream Driver was originally staged in 2013 as a "visual album" in an event that also served as the cassette release party for Bozeman's album PARADISE II "DREAM DRIVER", recorded with Javier Morales. The installation consisted of 10 projectors being fed by 4 robotically controlled cameras run through video effects controllers. Both projectors and cameras were trained on an installation of wall-mounted lighted boxes with plants on top. The lights in the boxes were controlled and "played" by William Kennedy. The Clocktower installation also included contribution from John Michael Boling, John Crowe, and Paul Slocum. To visit the project's website at CLICK HERE. Dream Driver performance at the Clocktower. Photo by Marcela Pardo. 2013. 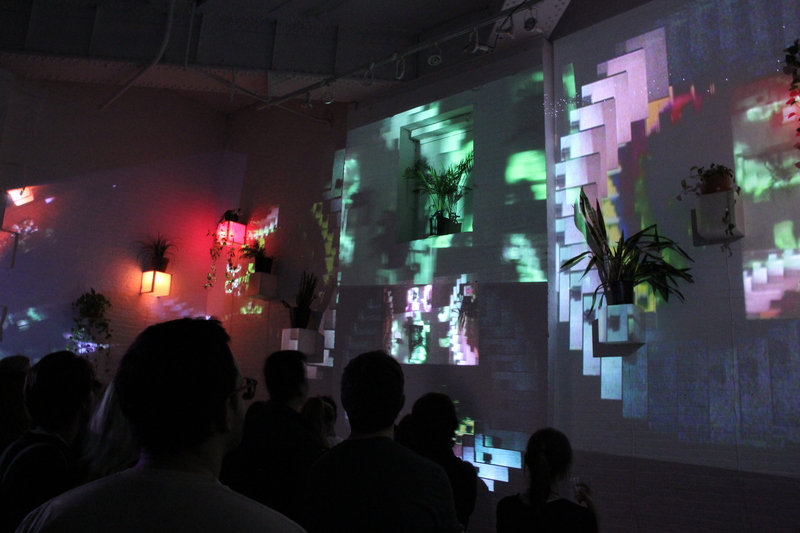 Video Paradise joins us in the main gallery for a visual listening party and album release. The full audio album, Dream Driver, and a video installation are played in tandem in a performance that immerses attendees in a sea of light and optical magic. The entire show is filmed on a full length VHS tape, serving as a "visual album," which is released following the event. The instrumental component of the album consists of songs recorded from January to July 2013 in New York City by Julian Bozeman and Javier Morales. The album was recorded as "transportation music" (music that will transport listeners) and is inspired by infomercial sound tracks, company profile videos, royalty free music, pop music melodies, and ideas about transportation. Video Paradise is provided by Julian Bozeman, John Michael Boling, John Crowe, William Kennedy, and Paul Slocum. DREAM DRIVER from VIDEO PROGRAM on Vimeo.